It is a newly-built and rather spectacular riverside complex, consisting of outdoor bars, cafes and restaurants. 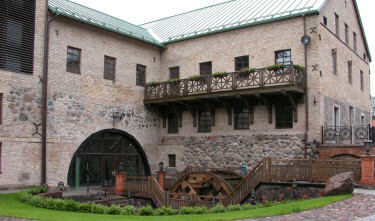 Restaurant is located on the Eastern edge of Vilnius on the banks of the River Vilnele. It takes 10 min by coach from the Old Town. Restaurant located in the city center at the Vassilievsky Island and offers amazing views. 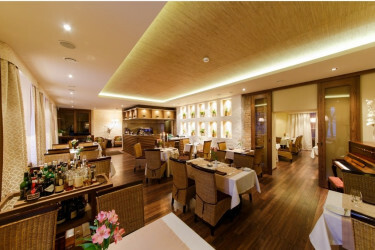 Inside the restaurant you can feel an unusual atmosphere of mixture of luxury and humor. Green marble, polished gilded bronzes, garlands of flowers, hand-painted murals on the ceilings and luxury sofas create a truly unique ensemble. Restaurant is a friendly place offering delicious food. The unique taste of the dishes still poses new guests to the restaurant. It attracts both Varsovians and foreigners looking for a traditional Polish cuisine, during the summer the largest garden at the market is filled with guests. Beautifully located in the heart of Riga Boulevard Circle, restaurant occupies first floor of a tenement house, constructed in 1875. 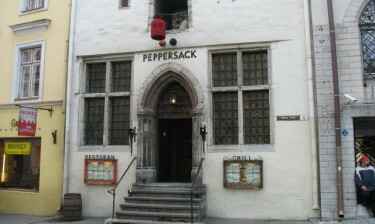 Restaurant has two halls with capacity of up to 50 people. It has obtained name “Forest” reflecting the importance of Latvian “gold” in folklore and contemporary culture. Glance through window opens view to National treasury – Opera house and city canal, while enjoying meal and drink. 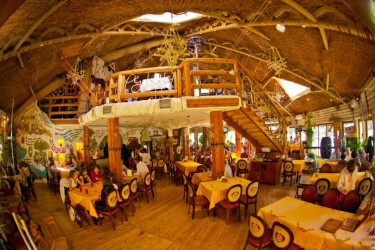 In the restaurant “O'Panas”, conveniently situated in the very center of the city, in one of the most picturesque parks of Kyiv, you can revel in Ukrainian dinner uniqueness. 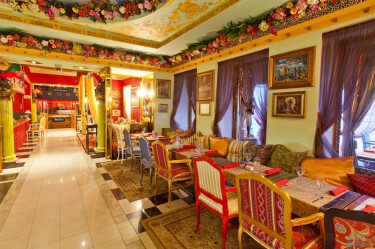 The Ukrainian interior made in the style of Ukranian Barocco it out gainfully among the other similar places. Thanks to huge windows you will be able to enjoy, peculiar only to “O'Panas”, diaramic view of one of the oldest parks in Kyiv—Taras Shevchenko Park. The wooden hatynka with a mill-wheel that goes round, a real tree that grows under the thatched roof—is the best place for having rest. It attracts you with its comfort and friendliness. It is a place with Ukrainian culture, traditions and manners.and contemporary culture. Glance through window opens view to National treasury – Opera house and city canal, while enjoying meal and drink. 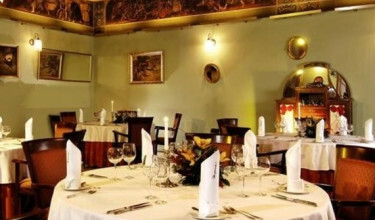 Restaurant "Devynioliktas amžius" or XIX century is located in a historical building, designed back in 1898 as a narrow-gauge railway station. It became important part of the city when city was growing and lacked new infrastructure. 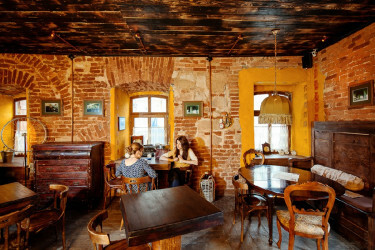 Building was finished in 1907 and once century later it was breathed for the new life – city restaurant life, offering XIX century spirit and Lithuanian hospitality. According to the legend, Lviv’s city hall clock master Petro Bratvanka, together with trumpeter Misko Pstrug, founded the restaurant. It was at the beginning of the 19th century when the city hall tower was ruined and the trumpeter, who used to work and live there, suddenly became homeless. The poor fellow was sheltered by his friend Petro Bratvanka and by joint efforts they found a way to earn money and do what they were good at – Pstrug (which means trout in the Carpathian region) started fish-farming, while Bratvanka started baking bread. As their businesses flourished, the lucky companions opened a restaurant, offering guests delicious fish dishes, fresh bread and good wine. 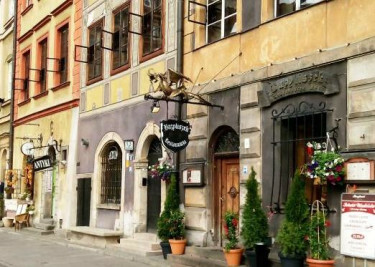 Located in the historic center of the city, it’s 2 floors specialize in grilled trout, following old recipes and offering oven-baked fresh bread.